Interview with a South African housing activist about recent struggles in Durban. Many activists in South Africa's largest shack dwellers' movement Abahlali baseMjondolo (AbM) have been fighting over the issue of housing rights for 15 years now. After the fall of apartheid in 1994, the new ANC government wrote into the constitution that the shack dwellers, living four or five to a room in hovels at the centre of South Africa's wealthiest cities, should have homes. But as time has gone on, successive administrations in the great conurbations, particularly the east coast port of Durban, have continued what many saw as one of the great injustices of white rule - the attempted removal of shack dwellers from prime real estate in the city centres. Instead of building houses where the shack dwellers already are, they build in the suburbs, a reinvention of 19th century urban planning models which force working-class people away from the opportunities, amenities and beauties of central living. AbM founder member Mnikelo Ndabankulu, tired though he is from several days of touring round London to promote the movement, has fire in his eyes as he talks about a forthcoming demonstration against this process. "In Britain, if people need houses in London, and the government build the houses in Manchester, what good is that? "You are taking people out of the frying pan and throwing them into the fire. We want the government to upgrade where we are, not just relocate us. "Our next protest is timed specifically well after the elections to show we will keep fighting for our constitutional rights - the politicians often think we will stop after the elections are over. At the moment they deliver on the constitution, but in a way we don't want." AbM was founded across 30 of Durban's 55 major shack dweller sites in 2005 after a particularly cruel case of this phenomenon. After years of lobbying to get new homes built at the Kennedy Road site, residents were faced with bulldozers threatening to tear down their houses - to build a brick-making factory. It was a major turning point. In the blockade of the road, demonstrations and police brutality which followed, a new voice was found for hundreds of thousands of shack dwellers. Zodwa Nsibande was at the early meetings which founded AbM and witnessed the establishment of a new form of organising in the city which rejected interference from administrators, party politicking and many of the NGOs which permeate Durban. She says: "Before AbM began every settlement was on their own, having meetings in different places. There was no stopping the mayor's office from doing what they wanted. "Then there was the blockade of Kennedy Road. "First the media tried to define who we were. Most of the community there which was part of the blockade was disgusted with what was being written and said we needed to define ourselves by who we are and how we live because it's more relevant to our struggles and lives. "There was a five-hour-long community meeting to decide it. "Now when we have to make a decision it depends on a mass vote. There's lots of different opinions within the community and we needed to come up with some new ideas. "We have a rule that there are no stupid ideas. People are not allowed to laugh at others - you have to respect everyone or it will put them off speaking again. "We believe in mass meetings because with delegate systems we can get into creating new empires for the individual. "So when we talk to the high-ups we will first negotiate how many people will be there, say 10, we will then elect people to go there and then they will take the options back to the community so the decisions can be taken on the ground." This bottom-up approach has won AbM few friends in the city administration. "The mayor and officials were not willing to negotiate because they were aware our agenda was different from theirs," Nsibande says. "So they tried to ignore us but that didn't work because we brought too much public pressure to bear. So then they talked, but didn't offer us anything. They are still talking." But what's been going on behind the scenes while talks carry on has been far more dangerous for AbM than simple delaying tactics. In 2007 KwaZulu-Natal's housing department, of all things, issued a new Act for the entire region - the Elimination and Prevention of Re-Emergence of Slums Act. It overturned legal gains at the end of apartheid, "the rights that people had said that if someone wanted to evict you they needed to go through the courts and alternatives to eviction had to be considered first," says Ndabankulu. "The 2007 Act doesn't state how evictions should happen or how it works with the earlier Acts. We campaigned against it as it was giving a lot of powers to the landlords and government and made resisting eviction an offence with 10 years' imprisonment. "You can't resist your own home being evicted, but if you and your family are being thrown out how do you just fold your arms and accept it? "It pressures land owners. If they don't protect their land they are fined. It's shifting responsibility onto them so the government doesn't have to carry out the evictions. It encourages landowners to evict people. "They didn't listen to us, so we are taking them to court in Durban. We lost our first hearing, so now we are on appeals and we are hopeful we can win this one. "We think that the state court will say that the housing department has no right to make up land acts - it's not their mandate. 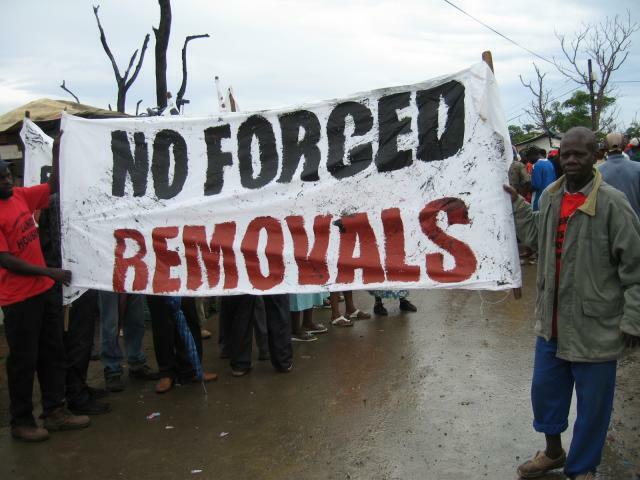 "The national government has already admitted that relocation has failed. "They have instead been offering funds to build on shack dweller land with but the municipal government don't want to use them because they want to move us out of the city. We don't want to move out, all the chances for a better life, jobs and education are here." Regardless of the court case, however, what has become clear is that if it was meant to provide the legal framework to break AbM, the Act has already failed, with enforcement being notably absent from the urban sites. "It hasn't affected us in the urban areas so much but further out of Durban people only find out about it when they are evicted - and rural people respect the authorities more so it happens more. In the urban areas people are vocal about it so they can't implement it," Ndabankulu adds. It is this refusal to go quietly which has won significant improvements for many of the shack dweller sites, which have campaigned hard for water, sanitation, electrification and land rights despite repeated attempts by Durban council bosses to withhold or even remove such amenities from them. And AbM, part of the wider Poor People's Movement incorporating similar groups across South Africa, is adamant that it shall continue to be a fighting organisation, not just for Durban but in solidarity with the rest of the world. Ndabankulu looks at me long and hard when I ask what people in Britain could do to help. "We advise people to find out more about us through our website (www.abahlali.org) and if possible listen to our daily programmes - what our opponents really want is to silence us. Some people, when we are facing this can send emails and messages of support or demonstrate at the South African embassies. "But what people must not forget is that we are not like an orphanage or something else forever needing support, we are comrades and we will offer our help to others as well. We support anyone who fights for the same cause as us. We are capable allies." Should probably be mentioned this first appeared in the Morning Star newspaper, don't think there's much of an issue with it being reused mind.